Summary: Ada lived in one of the poorest places on earth, Cateura, Paraguay, home of the garbage dump for the capital city of Asuncion. Most adults there survive by picking through trash, finding items they can recycle and resell to make a bare subsistence living. Ada and her classmates appeared to be heading for the same lives as their parents, until a man named Favio Chavez came to town and offered music lessons. The problem was, he only has a few instruments, and they were so valuable that the kids were afraid to carry them home. So Chavez got to work making instruments from objects he found in the trash. Before long, there were enough kids playing to form an orchestra. 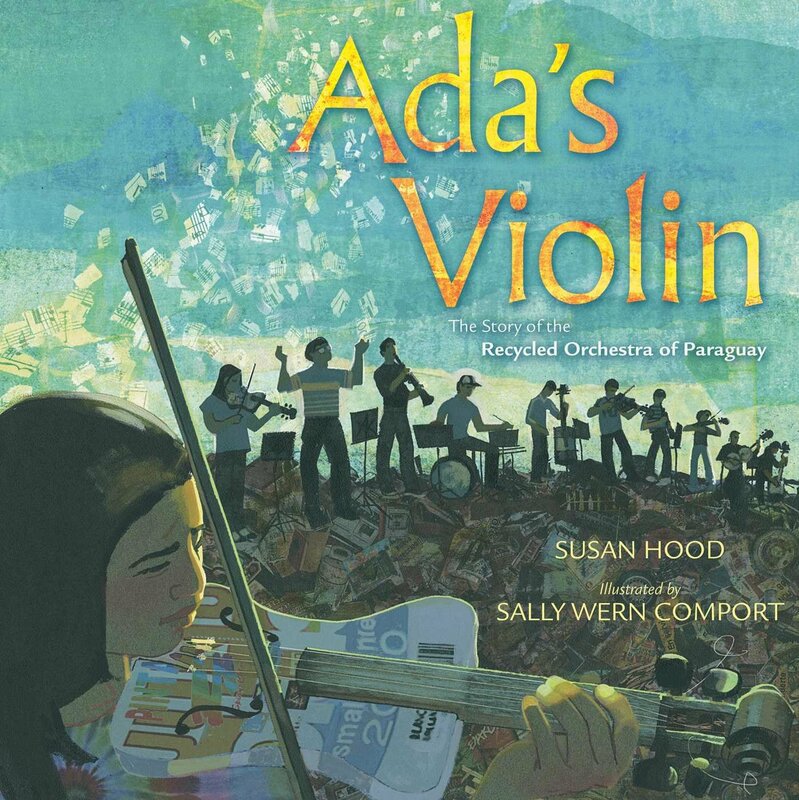 Ada loved music and worked so hard that she became first violin. The orchestra has traveled all over the world, and even opened for a Metallica concert. Back matter includes an author’s note, sources, and photos of the orchestra and some of their instruments. 40 pages; grades 1-4. Pros: An inspiring story of how one man has made an amazing difference in the lives of an entire community. The illustrations do a great job of capturing the designs of the different instruments, as well as the emotions of their players. Cons: I wanted to hear the music! Fortunately, YouTube helped me out. Just search for “Recycled Orchestra of Paraguay” to learn more and to see and hear these amazing instruments in action. This subject was featured on 60 Minutes recently. I was fascinated and inspired! Now am eager to see the picture book.